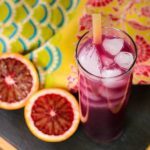 A recipe for a Blood Orange Pineapple Rum Cocktail. This beverage is made with white rum, pineapple juice, and fresh blood orange and lime juices. Stir together all ingredients and pour into two glasses filled with ice.